Much time, energy, and expense is spent by men getting trained for a career in the work world. Although it is important to be trained to make a living, more importantly a man needs to be equipped with the tools to live a life that glorifies God, adds value to his closest relationships, and ultimately results in great rewards in this life as well as eternity. 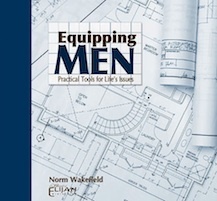 Equipping Men provides exactly what a man needs to live a full, free, and rewarding life. The series is also a practical resource for training young men and women. Equipping Men prepares sons to be husbands, fathers, and leaders of their generation. Young women and wives may also benefit from the lessons as they gain a deeper understanding of men, their fathers and husbands, and learn how to use the same relational tools provided in the series. The new Equipping Men series is a vast improvement on what has already been a very helpful tool to many in its original form. The series now consists of 20 lessons; five new messages have been added and the lesson lengths have been shortened to make them more conducive for small group use in homes, Sunday Schools, or men's meetings and retreats as well as individual listening or watching. A study guide with notes and discussion questions is available in PDF format. We're glad you've been led to this resource for building up men and their families. We hope and trust that God will use each message to deepen your relationship with God through Jesus Christ and equip you to lead your family to the same. Titles in the series, in all media versions, are summarized below. When a man doesn’t know his identity, he has nothing in which to anchor himself. Like a boat without an anchor in a storm, he can be blown about by the spiritual wind of the culture. A society of men without an identity is a society on the road to destruction. Fathers are vital to the stability of any nation or church because they establish identity. Integrity is having the same identity before others, in every place, at all times as one does before God. Proverbs 10:9 indicates that the man who walks in integrity walks securely. You’ll learn why acquiring integrity is important and how to be a man of integrity. God wants to bless His people and has given them a blueprint for blessing. You’ll discover this blueprint and see that it has been on the mind of God since He first brought His people into the Promised Land. Do you know the blueprint for the family that brings the blessing of God? John the Baptist ministered in the spirit and power of Elijah to turn the hearts of men to God and to their children to prepare people’s hearts for the Lord. The Spirit of Elijah is moving. You’ll learn how you can be a part of this powerful movement of God and impact others for the Lord. In the wisdom and love of God, He sent John the Baptist as a forerunner to go before His Son. He sent a forerunner so that His people would know what to look for when Jesus Christ came to earth. In the same way, God has provided fathers to be forerunners for the Lord Jesus Christ in the lives of their children. How does a man be a forerunner for the gospel? You’ll learn how God works in the hearts and lives of your children to teach them the gospel and bring them to Christ. Also, you’ll discover a father’s part in creating a culture in the home that is gospel centered instead of dedicated to managing sin in his children. What happens when fathers don’t call out sons? Norm not only shows the importance of calling out sons, but outlines practical insights from the heavenly Father’s relationship with His son. You’ll be encouraged as you see God’s work in your own life as His son gives insight into how you can call out your son into manhood God's way. Daughters look to their fathers for affirmation of womanhood, but how does a father provide what a daughter needs to become secure in who she is as a woman? Norm answers how a father can minister to the basic spiritual and emotional needs of the women in the home. Living to love is important because God commands us to love. If we’re to love with God’s kind of love, we need to distinguish between the world’s kind of love and God’s kind of love. Living to Love will give you a new view of relationships for the rest of your life. Norm shows why the Love Principle: You can’t love anyone you idolize is true. The key to living to love is living to repent of idolatry of heart toward people. What does that look like? Living to love is also dependent on living in and through Jesus Christ. Such love powerfully impacts all relationships. Can you tell when there’s a breach in relationships? How can they be restored. Norm provides a helpful checklist so you can recognize when someone’s heart is closed and then take steps to overcome the road blocks and establish a healthy relationship. It is self-evident that everyone wants to be happy. Many are tempted by the spirit of antichrist to pursue happiness by worldly means. How can you world-proof you and your children? By learning how to recognize the spirit of antichrist and fleeing from its influence. Only one source has the power to make us truly happy, the Spirit of Holiness. You’ll learn now to recognize the ministry of the Holy Spirit and how to walk in fellowship with Him as you pursue true happiness. There is in the flesh of every man a wolf with an insatiable appetite to use women for selfish pleasure and happiness. Norm explains the spiritual dynamics of the lusts of the flesh and how to turn the wolf into a seeing-eye dog that leads a man to God, the Father, for fullness. The instruction of the Lord for men in their relationships with women is clearly taught in 1 Thessalonians 4. In this passage Norm presents two positive and three negative principles that the Lord gave to us so we can know His will and walk in purity. There is an order and flow to the Word of God from heaven throughout His creation. Men have the responsibility to keep their families in the flow of God’s Word and will. In this lesson, you’ll see God’s order and gain an understanding of how you can experience God’s blessing in your life and family. Understanding the relationship in the Trinity helps men see the attitudes, dynamics, and principles of leadership that glorifies God. Norm explains how the understanding of jurisdictional truths leads to the application of principles of leadership that provide security and order in any sphere of influence. Leaders who understand vision principles have the tools for creating an environment that produces order, security, peace, and happiness. You’ll gain an understanding of the importance of leading your family and others whom you lead with vision. Where the vision is clear, unity, security, order, and peace can grow. However, when men are passive and don’t provide vision, there is confusion, disorder, conflict, and fear. You’ll be excited to see how you can be a man of vision to bless those you lead.